The afro doesn't get enough love. 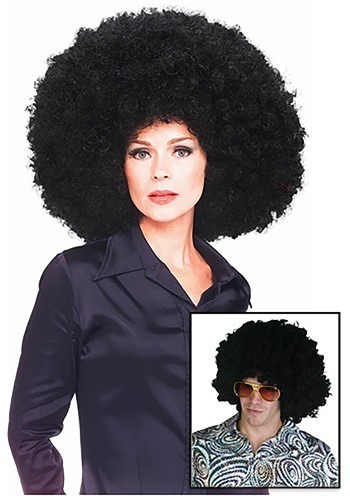 We admit, back in its heyday of the 1970s, the afro was all the rage and it felt like everyone was sporting a big ol' head of hair, but if you look around today, how many afros do you see? Probably not many, unfortunately. Which is a shame, because that big bushy head of beautiful hair is a fantastic look and should be celebrated properly. If you don't have the locks to pull off this righteous look but still want to shine, now's your chance. Plop this curly mane on your head and enjoy the passionate glances you'll get from passing strangers. Because the energy attraction from a good afro is unavoidable. Make sure to grab an afro pick to keep your curls looking fresh too! A well-maintained afro is a thing of beauty, but a messy, unkempt afro shows you don't appreciate true hair sophistication. So get out there and make this your signature look!